The IDF is investigating the second UAV crash in three months. An Israel Air Force UAV (unmanned aerial vehicle) went down in the Mediterranean on Tuesday. The IDF spokesperson’s office confirmed the crash, and said it will be investigated. Navy ships and an IAF helicopter worked together to pull the UAV out of the water. 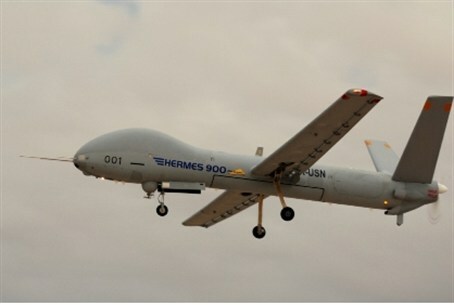 The UAV that crashed has been identified as a Hermes 450 model. In mid-July an Israeli UAV crashed near the border with Egypt. IDF officials said the crash was deliberately caused by operators in response to a technical problem. That UAV, too, was located and taken in for analysis. The IDF’s elite UAV operating force, Sky Rider, has been undergoing upgrades and changes over the past several months, with the goal of attaching a UAV squad to every active IDF battalion. The trend of IDF investment in advanced UAVs is expected to continue in upcoming years. Israel’s enemies are scrambling to obtain advanced UAVs of their own. Hamas terrorists in Gaza created a drone in late 2012 that experts believe would have been capable of reaching Tel Aviv; however, the drone was destroyed in an IDF airstrike along with other of Hamas’ UAVs.